After what seems like a zillion hours or counting and deliberating, I've got the contest results. One person in the competition was unfortunately disqualified to do two reasons, one being that she doctored her nail design in Photoshop (or other photo manipulation program), which was the main reason, but to add insult to injury, she was 'buying' votes by offering extra entries to her giveaway. I have to say that next time I will actually OPEN the photos before posting them next time, because the photo manipulating was quite obvious. Sorry to that entrant, but you should have known better. This was TOTALLY not in the spirit of the blog or the contest, and to say I'm disappointed and irritated is a serious understatement. Giveaways on blogs (especially with this many entries) are a HUGE undertaking, and the time and money spent getting them up and running is considerable. The next giveaway will not utilize ANY voting by peers of entrants/readers due to the experience of this contest. Sorry to be a party pooper with all that. On to the results! The only votes that were counted (as stated in a later post) were votes from registered Google or OpenID accounts. First and second place are divided by just 2 VOTES!! Thank you all for the great entries!! Winners, please email me your mailing information to thedailynail@gmail.com!! I'm glad to see vindication and that even though there was controversy, some really good designs won. All 3 are amazing! Very cool! Wow. Seriously people! Anyway, congrats to the winners. You had some great entries. Yay! I really liked Thifa's design. Congrats to all of the winners! I went through and tried to find the photoshopped one but obviously I'm horrible at identifying the doctoring of photos because I couldn't find it. Oh well. I like Lindsey's the best but they all rock. more power to ur blog melissa!! I can't figure out which one is photoshopped either. I'm thinking the one with the palm trees & moonlight. It just looks too perfect to be real but I could be wrong! I'm just going to come out and say it since we're all thinking it - it was in the comments before that maryya's was photoshopped- and she gave other people entries to her blog giveaway for voting for her. i saw it myself. congrats to the winners!! tlking about those that did wrong only gives them more attn than the ones that deserve it!! good job everyone!! thanks for taking the time to figure out ppl were cheating!! The palm trees & moonlight are perfect, congrats! I'm glad my two favorites got into the first places too. I really like the cookies (reminds of my grandma) and Naluma's for being just sooo well done! Did you use a pen, Naluma? Congrats to the winners! So glad Lindsey got to the final three, love those cookies! Yaaaay my favorite won! 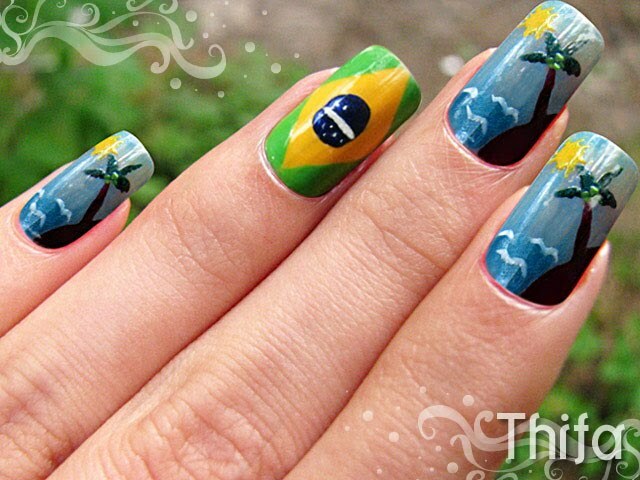 Brazilian flag is wonderful!!! Love the Brazil flag nail. Congratulations, Thifa!!! The nail art is so perfect!! I'm brazillian, so I loved the flag. It's nail polish, people... it's supposed to be about having fun, not crushing your competition. If that's all you're here for, maybe you should find another hobby? Fiquei muito feliz por estar em meio as vencedoras. O que lembrava meu lar, transformei em pintura. O gatinho que pintei, era meu há 6 anos, mas faleceu. Fica aqui minha homenagem a ele. Obrigada a quem votou em mim. Thanks for having this contest. Sorry it was a bit stressful for you, but I had fun participating. Thanks to the few who voted for me! I sorta get the feeling the one with the moonlight and beach was 'shopped. It looked a tad fake. To Melissa, thank you for this challenge. I had a really nice time doing it. nossa esse e o mais lindo de tds,a bandeira do brasil! Ameeii! I'm brazilian, I like it! Brasil, Brasil, Brasil! i am brazilian! and i no speak english, por isso vou falar em portugues mesmo! eu nao gostei, eu amei! amo o seu trabalho, parabens!! oh, great! I loved your blog. 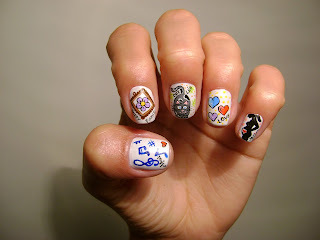 I am Brazilian and I and my colleagues love to paint my nails and now I knew your blog have many tips! bye!